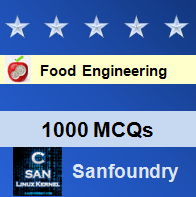 This set of Food Engineering Multiple Choice Questions & Answers (MCQs) focuses on “Principles of Fresh Food Storage-1”. 1. Statement 1: Time is an important parameter for the growth of spoilage organisms. Statement 2: Temperature is an important parameter for the growth of spoilage organisms. Explanation: Both, time and temperature are important parameters for the growth of spoilage organisms. Explanation: All of the mentioned are factors which affect the length of storage of fruits and vegetables. 3. Statement 1: A harvested fruit contains many oxidative substrates required to perform respiration. Explanation: A harvested fruit contains many oxidative substrates required to perform respiration. Different species of fruits have different patterns of respiration. This is called as climacteric. 4. In the climacteric, the ratio of the highest peak to the minimum _____ with temperature. Explanation: In the climacteric, the ratio of the highest peak to the minimum increases with temperature. 5. Statement 1: In the climacteric, the ratio of the highest peak to the minimum varies with temperature. Statement 2: In the climacteric, the ratio of the highest peak to the minimum varies from fruit to fruit. Explanation: In the climacteric, the ratio of the highest peak to the minimum varies with temperature and varies from fruit to fruit. 6. Statement 1: After harvest, there is a decline in the uptake of oxygen. Statement 2: After harvest, there is a sharp rise in the uptake of oxygen. Explanation: After harvest, there is a decline in the uptake of oxygen. This is followed by a sharp rise to a peak. Explanation: The slope of the climacteric varies with maturity, species and oxygen and carbon-di-oxide content of the storage chamber. 8. Statement 1: Ripening of fruits is accompanied with a lot of anabolic and catabolic reactions. Statement 2: Certain fleshy roots, tubers and bulbs have low metabolic activity and are dormant until there are environmentally favorable conditions for germination and growth. Explanation: Ripening of fruits is accompanied with a lot of anabolic and catabolic reactions. Certain fleshy roots, tubers and bulbs have low metabolic activity and are dormant until there are environmentally favorable conditions for germination and growth. Explanation: Fleshy fruits after ripening are consumed. 10. Statement 1: At low temperatures, the rate of respiration of harvested fruits and vegetables decreases. Statement 2: Under conditions where respiration rate is retarded, changes in chlorophyll loss are also delayed. Explanation: At low temperatures, the rate of respiration of harvested fruits and vegetables decreases. Under conditions where respiration rate is retarded, changes in chlorophyll loss are also delayed. 11. Which is NOT a facet of cellular loci and messaging? Explanation: All of the mentioned are facets of cellular loci and messaging. 12. Statement 1: In cellular loci and messaging, the link is the mechanics of quality change. Statement 2: In cellular loci and messaging, the machinery is the biochemical control. Explanation: In cellular loci and messaging, the machinery is the mechanics of quality change. In cellular loci and messaging, the link is the biochemical control. 13. In the biochemistry of plants, which of the statements hold wrong? Explanation: None of the mentioned statements with respect to the biochemistry of plants hold wrong. 14. Keeping in mind that texture changes take place after harvest, pulpy fruits become extremely hard after harvest. Explanation: Keeping in mind that texture changes take place after harvest, pulpy fruits become extremely soft after harvest. Whereas, vegetables such as beans harden on harvesting. 15. Statement 1: After harvest, _____ of fruits and vegetables undergoes change. Statement 2: The _____ in pre-harvest and application of _____ to post-harvest can change the stress response in harvested commodities. Explanation: After harvest, both, the texture and color of fruits and vegetables undergoes change. But the correct order of the second statement is- The nutrients, in pre-harvest and application of minerals to post-harvest can change the stress response in harvested commodities.